Verdant green asparagus takes on a mild nuttiness when roasted, making it the perfect base for a few other ingredients with a similar flavor profile. 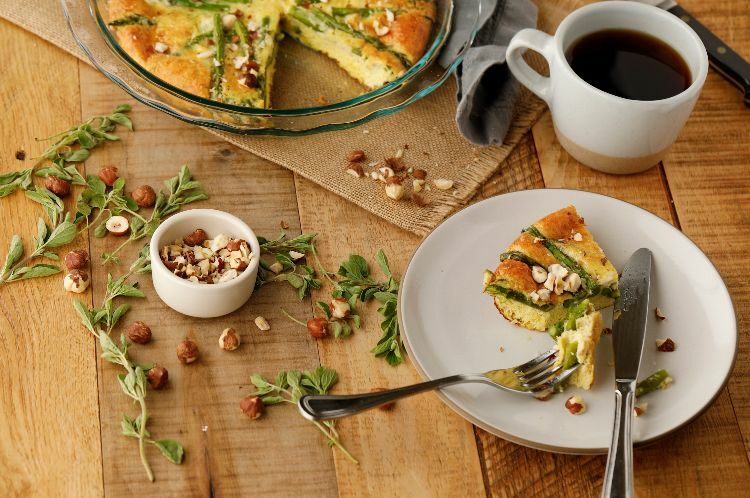 This recipe combines asparagus, Parmesan cheese and hazelnuts for a vegetarian bake that your whole family will love. And the best part? The recipe below doesn't even take 30 minutes to make. Use pencil-thin green asparagus for the best results. Not only are they more tender and sweeter than the fatter ones, but they're also easier to prepare. You'll sometimes need to remove the fibrous outside of larger asparagus before cooking it. But with thinner ones, all you need to do is snap off the woody ends and enjoy! Preheat the oven to 350 degrees. 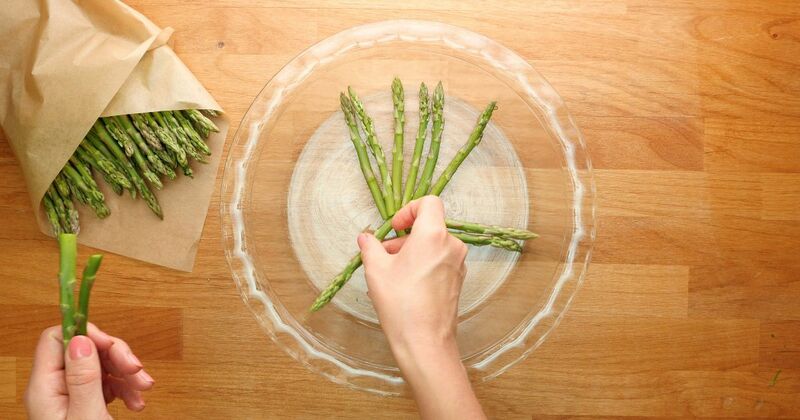 Grease a silicone tart pan, and arrange the asparagus in a wheel with the tips towards the outside. Set aside. Whisk the eggs and half-and-half together. Season with salt and pepper. Add the Parmesan, and whisk well to combine. Carefully pour the egg mixture over the asparagus, pouring slowly so that the asparagus doesn't move. When the bake is cooked through, allow it to cool slightly before unmolding. Scatter the chopped hazelnuts over the top, and drizzle with the hazelnut oil. Scatter with the Parmesan peelings and serve. Need a hearty way to warm up over the winter? This vegetarian tortellini soup is simple to make, easy to store, and is filled with loads of nutritious veggies! Roasting the cabbage adds an extra layer of flavor to this seemingly boring vegetable. The caramelization creates an amazing flavor that simmered or raw cabbage simply lacks. This vegetarian version of the childhood classic has a chickpea and sautéed vegetable base, but the ketchup sauce, seasoning, and presentation guarantee every bite is a taste of nostalgia.